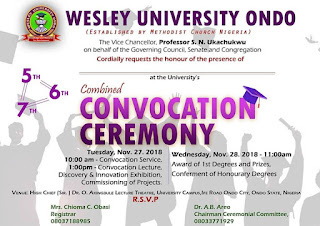 Wesley University, Ondo State 5th , 6th and 7th Combined Convocation Ceremony Programme of Events for the Award of First Degrees, Higher Degrees and Honorary Doctorate Degrees 2017/2018 Academic Session. 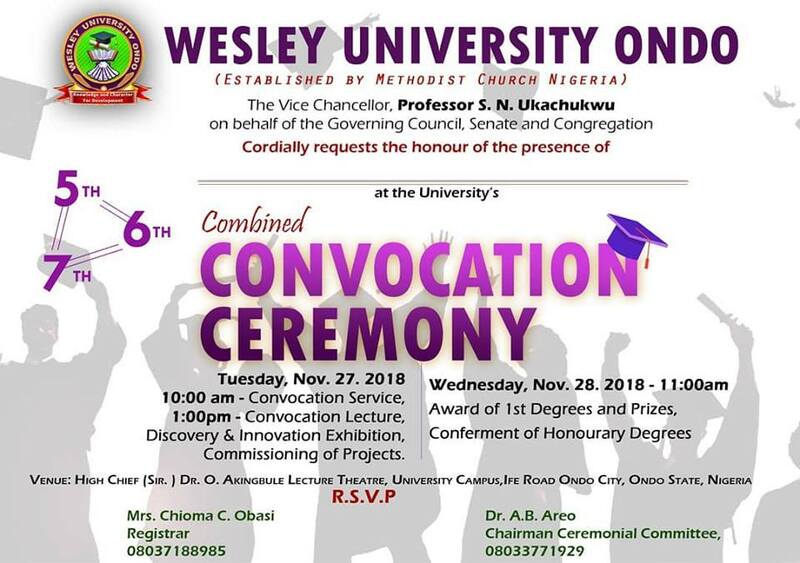 This Vice Chancellor Professor SN Ukachukwu of the Wesley University, Ondo State, on behalf of the Senate, Staff and University Community cordially invites the general public to their 5th, 6th and 7th Combined Convocation Ceremony which leads to the Award of First Degrees, Higher Degrees and Honorary Doctorate Degrees for the 2017/2018 Session. Convocation Lecture, Discovery and Innovation Exhibition, Commissioning of Projects.